Renewable energies instead of fossil fuels — this is the future for home heating as in other areas. Heat pumps play an every greater role here. However, they vary greatly in output, installation effort and costs. Of the 18 million heating plants installed in Germany, not even 20 percent conform to the current state of technology. This means great potential for state-of-the-art systems that use renewable energies. The heat pump is one solution for energy-efficient heating and hot water. However, it is not suitable for every home-builder or renovator. Though they all share the same principle, the type of heat source, output and installation effort differ greatly. In principle, a heat pump works like a refrigerator: While the kitchen appliance draws heat from foodstuffs and discharges it without being used, the heat pump takes heat out of its surroundings and transfers it to a heating medium. In doing so, the pump uses a refrigerant with a very low boiling point. The refrigerant evaporates as soon as it flows past a heat source, drawing energy from it. A compressor condenses the refrigerant, which is now in the form of a gas, thus increasing its temperature. The high-temperature gas finally transfers the heat to the heating or domestic water. Thus it takes approximately three-quarters of the energy it needs for heating and water heating in the home. The compressor uses the other quarter, mostly in the form of electricity. 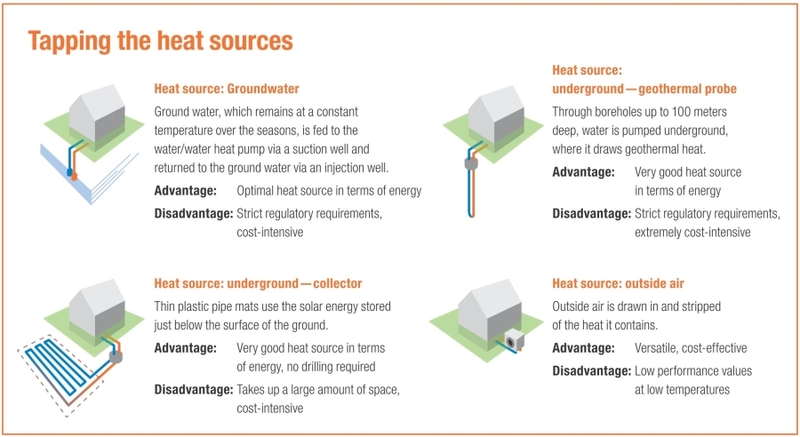 Heat pumps are “solar collectors” with a twist: They use the solar energy stored in groundwater, underground and in ambient air. The different types of heat sources can also be used to distinguish between types of heat pumps (the medium to which the pump gives off heat is always water): water/water heat pump, brine/water heat pump and air/water heat pump. Which heat source is ideally suited for a specific heat pump project depends on factors such as whether the building is new or renovated and what kind of pipe is required. The local basic conditions, such as the composition of the ground, and the funds available for investment must also be taken into account. Some of the various sources can be used only by employing complex technology. Even in winter, groundwater has a relatively high temperature — in Germany, between seven and twelve degrees Celsius. Moreover, purely from an energy standpoint, water is the best heat source. Water/water heat pumps thus attain very high performance figures. However, tapping into the groundwater is expensive and requires a permit. A total of three holes must be drilled: First, a test bore has to be drilled to determine whether the required limit values for water quality are complied with. Then, what is called an injection well is drilled, followed by a pumping well. From an energy standpoint, beneath the ground is also a very good heat source. At a depth of up to one and a half meters, the temperatures are likewise in the range from seven to twelve degrees. The brine/water heat pump can also use this heat via a ground collector. This is based on thin plastic pipe mats that are buried horizontally at a depth of 1.2 to 1.5 meters. However, this system requires a large open garden area that cannot be built on in the future, as doing so would impair the performance of the ground collector. A second method of using geothermal heat involves the geothermal heat probe. The effort for tapping the necessary deep bore hole is comparable to that for a well: 100 meters deep with a diameter of 20 centimetres. Moreover, it is difficult to obtain permission from the water authority. Air is available everywhere and can be used without a permit. Whether indoor or outdoor installation, air/water heat pumps are extremely flexible and the effort required for tapping this source is low. Moreover, high-efficiency devices make optimum use of the potential energy in the air. In new construction and, particularly, in renovation of living space, which needs only smaller-scale modifications to the area surrounding the house, the air/water heat pump is ideal. State-of-the art devices make it possible to use the heat present in the outside air, even at icy temperatures as low as 25 degrees Celsius, for heating and hot water. By using the latest technology, these devices extract heat from the air to provide flow temperatures for heating circuits of over 60 degrees Celsius. Where heat pumps are usually suited only for use with wall or floor surface heating systems, new high-efficiency models also enable renovations in old buildings that are heated using radiators. 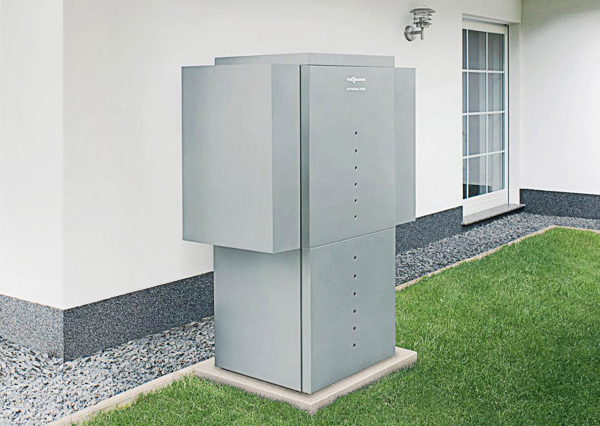 Therefore, these heat pumps attain annual performance factors, with high coefficient of performance (COP) values around 4, which also has a positive effect on the user’s wallet. Today’s devices attain this increased efficiency with innovative components and optimum interaction. Two variants of air/water heat pumps are on the market: one for indoor and one for outdoor installation. Both place different requirements on the aerodynamics. In indoor installation, the device takes in the outside air via one duct and exhausts it through another one. Pressure drops take place through these ducts. Therefore, compact centrifugal fans are ideal for this purpose. These are suitable for a high pressure build-up and take up only little installation space. A great example is the RadiCal® series from ebm-papst: even today, the new centrifugal fans exceed the ErP efficiency directive that will soon be in effect, cut both energy consumption and noise behaviour in half and feature extremely compact dimensions. Because in outdoor installation, the condenser is outdoors with only a refrigerant line leading indoors, space requirements and pressure drop are usually not an issue — though the noise level is, particularly at night. To avoid having to switch off the heat pump at night, axial fans that can be run at lower speed are well suited. Take, for example, the HyBlade® from ebm-papst. Thanks to its GreenTech EC motor, it can be adjusted flexibly, allowing it to run at lower speed at night. Moreover, it is significantly quieter over the entire speed range and needs some 30 to 50 percent less power than a fan operated with an AC motor. EC fans are just one of many high-efficiency components for giving air/water heat pumps even higher performance. The greatest energy consumer in each heat pump is the compressor. Therefore, modern devices use a more efficient direct current compressor. To optimise the operation of the evaporator, electronic expansion valves are used. However, air/water heat pumps do not reach full efficiency unless the innovative components also work together intelligently. This is achieved by controls from Argus Vision, the Netherlands-based ebm-papst subsidiary. The integrated, weather-guided control system with room temperature compensation adapts the speed of the EC fans, activates the converter on the compressor in a demand-oriented manner and operates the expansion valve of the condenser at the optimal operating point. A user-friendly operator interface provides even more comfort and convenience for this sustainable heating system. The COP value (coefficient of performance) is the ratio of heat output to the electric output used at a certain operating point. The calculation also includes the output of auxiliary devices, the defrosting energy and the proportion of pump output. A COP of 4 means that four times the supplied power is converted into usable heat. The annual performance factor is the key figure for evaluating the energy performance of the overall system. Calculated over a period of one year, it designates the ratio between the quantity of heat given off and energy fed into the system.